The news overnight of the bombings at the Boston Marathon is horrible. Many friends on Facebook are committing themselves to prayer for those affected, and asking others to do the same. As the FBI investigates and no organisation has boasted that they caused the carnage – sorry, ‘admitted responsibility’ – many are left devastated. Still others are saying, ‘Why distinguish? Pray for them all,’ and I agree with that. Death is death. Violence is violence. But it has left me with questions about why our news media and our society are more taken up with Boston than with Baghdad. Do we react more to situations where potentially we have more connection? Americans are more like us than Iraqis are. 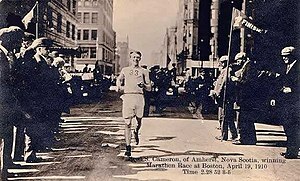 The Boston Marathon (the world’s oldest – more than a century old) makes us think of the London Marathon, which is due this coming Sunday, and security measures there are being reviewed as a result. Many of us know friends who have run in the London event – I certainly do. Maybe a few of us have been runners there (not me). That brings the fear closer home. For Brits, it will certainly recall ‘The Troubles’ in Northern Ireland, along with the way they spilled over to the UK mainland. And as Americans will recall 9/11, we shall think of 7/7. So does ‘compassion fatigue‘ reduce our ability to empathise with those for whom we lack that kind of personal link? And if it does, how can we recover compassion without becoming so overwhelmed that we are crushed and left in a state of inertia? Is it not important for Christians to love those we don’t know, as well as those we do (or feel we do)? Certainly, Jesus had words in the Sermon on the Mount about not just loving our friends. He meant we also needed to love our enemies, but can we not also extend that to the importance of loving those unknown to us? What do you think? How do you believe we should respond to these atrocities? Posted on April 16, 2013, in Current Affairs and tagged Baghdad, Boston Marathon, compassion fatigue, London Marathon. Bookmark the permalink. 4 Comments. Great post, Dave. Picking up this for this week’s United Methodist Insight, to give us a more global perspective. Thanks so much! Very kind of you, Cynthia, thank you.